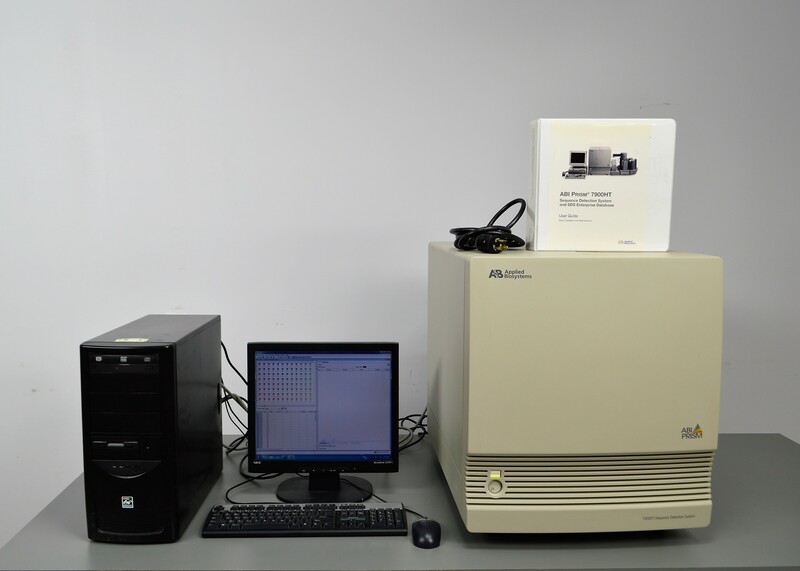 Applied Biosystems 7900HT PCR Sequence Detection System w/ PC & Software 96-well . New Life Scientific, Inc. This ABI Prism 7900HT PCR unit features sequence detection in a 96-well plate format. The technician paired the 7900HT PCR with the PC workstation and SDS software by starting a 'new experiment' in the software. The side access door was opened and closed, extending and retracting the 96-well plate arm. Without the calibration kits and dyes, the technicians cannot perform actual testing (PCR). The laser was inspected, but the hour meter reported an 'error,' which could mean the laser is malfunctioning; the status LED should illuminate solid red, if the laser required replacement. There are a number of third parties that sell compatible lasers, as does Applied Biosystems for an OEM part. New Life Scientific has priced this PCR detection system with consideration to the laser's condition. While New Life Scientific takes many steps to ensure that the instruments are in perfect working order, we cannot ensure that all products are up to manufacturer specifications. We recommend every product undergo professional installation and calibration before use in research, production, and clinical applications. For this reason, we offer a warranty for all working products in the interest of maximum customer satisfaction.